For those of you who were like me and did not venture to the Disneyland Resort to celebrate Disneyland’s 56th Anniversary there was one scheduled event at 2:30pm in Town Square. This event consisted of quite a few characters coming out and lining Town Square. The dedication speech was played, a traditional Happy Birthday Sing-A-Long followed, then a song was played as the characters headed backstage (along the way they gave out some balloons and high fives it appeared). The event was billed as a moment and that is what it turned out to be. For those of you who attended what did you think? This seemed to be about on par with what other “off year” anniversaries have held. In case you missed it last week I posted pictures of several recent ones in the Flashback section. Last year for the parks 55th they had a couple special events. There was a rededication in the morning, a All American College Band Re-union in the afternoon, Opening Day films in the Cinema, and then a “flash mob”/dance number during the afternoon moment. The best costumes I have seen so far. 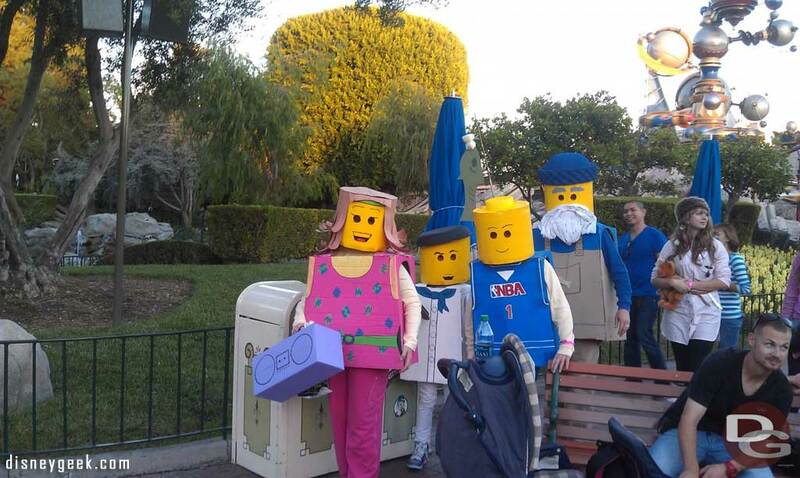 A Lego family roaming the park.